Continuing our theme with easy no-bake treats that cost under $5 or less, I wanted to share with you my easy microwave peanut brittle for holiday gift giving. Making peanut brittle in the microwave is so easy and is the perfect gift to give for the holiday season. If you haven’t tried making microwave peanut brittle, you are in for a real treat. 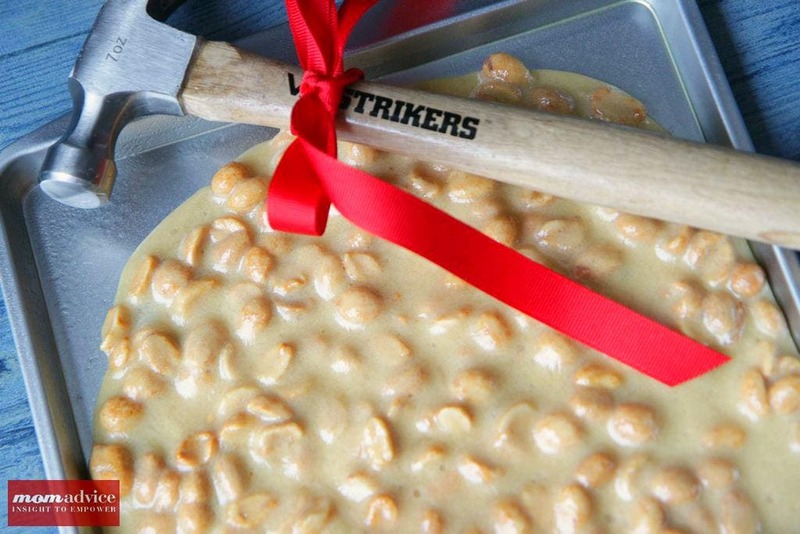 This brittle makes a perfect guy gift to give paired with an inexpensive hammer tied with festive ribbon. I found my hammers at our local hardware store for $2.99 and found cookie sheets for giving at our dollar store for a buck. With a few simple ingredients in your pantry, you have the makings for an easy gift to give and to share around the holiday season. The only trick with making peanut brittle in the microwave is keeping a CLOSE eye on it so you don’t burn your nuts. I used my Pampered Chef large batter bowl to prepare the brittle in and found that six minutes seemed to be just the right amount to cook it in the first stage. Microwaves and bowl sizes vary so check it after five minutes and see how the brittle is looking. 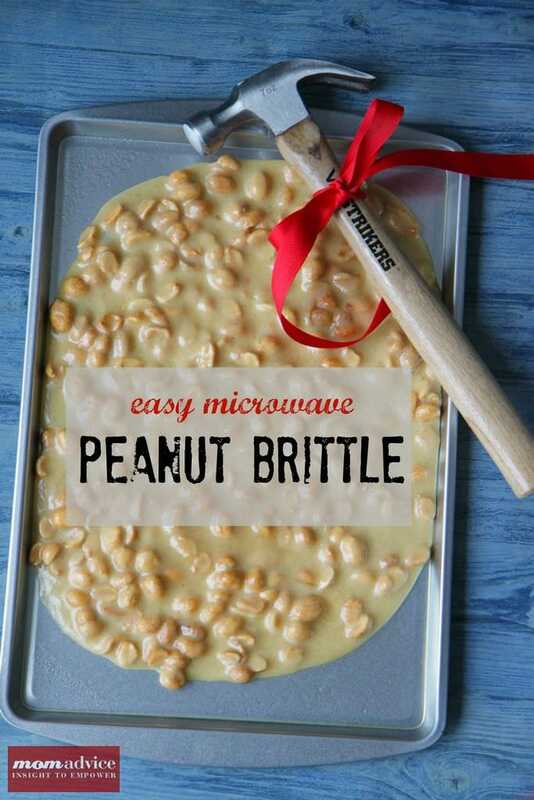 An easy peanut brittle that you can prepare right in the microwave. Package it with a hammer for a fun guy gift for the holiday season. Grease a baking sheet & set aside. Cook in microwave for six minutes on high (keep one eye on it to make sure it isn’t bubbling over or burning the nuts). The mixture should be bubbly and the peanuts should be brown. Stir in butter & vanilla; cook for two to three more minutes. Quickly stir in baking soda, just until the mixture is foamy. Pour immediately onto greased cookie sheet. Let cool for fifteen minutes or until set. Break into pieces. If packaging for gifts, leave the brittle in tact and package with a hammer for gift-giving. Looking for other easy & inexpensive gifts to give? 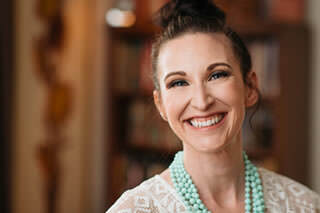 Check out my tutorial for Sugar & Spice Nut Mix, Knitted Coffee Cozies, DIY Monogrammed Wine Glasses, Homemade Peppermint Marshmallows, Gingerbread Biscotti, Easy No Bake Cheesecakes in a Jar, and DIY Mustache Mugs! Not enough for you?? Here are 36 more holiday gift ideas!